The Product & Price Visibility extension can hide products, product prices, or entire categories based on various visibility rules set by admin. If sometimes you need to hide selected products or prices from not registered users and show for registered customers - this module is all you need. You can make selected products completely invisible for some customer groups. Or you can hide their price and ability to add to cart only (for example, your retail customer will not see products visible for wholesalers, or will not see the prices). You can also set custom stock status to selected products or to the entire category. For example write stock message "Available for wholesalers only", or "Log in to see prices". Selected products or their prices can be invisible all the time for some customer groups - or you can set a time limitation (in case you want a featured product be available for wholesalers only for a limited time, and then it should be available to all customers). 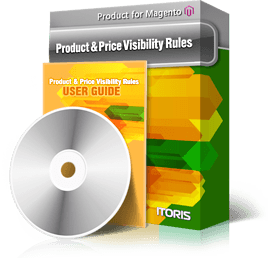 Product and price visibility rules will be applied to all standard Magento product areas (catalogs, search results, product details’ pages, wishlists, related products’ blocks, and so on). Yet if you wish ability to set visibility rules only within a product’s category, or globally for all products - you can do this with the extensions as well. ZIP Package for Unlimited installations†. No special Installer required‡. ‡ Simply unpack the .zip archive to the root of your Magento. DEMO 1: Products' Visibility in the Catalog. Not logged in users see 1 product. Logged in users will see 3 more products. Register a customer to see the difference. DEMO 2: Replace the Price with a custom message. In the example the price has been replaced with custom message "Please log in to see the price". No risk at all. 60-day money back guarantee. One license per one Magento® installation. No store, website, or domain limitation. No monthly or hidden fees. Never pay for updates! Simply download the latest version of your favorite extension from our website when you need it. Contact Us and we will help you install our extensions absolutely for FREE. No obfuscation, no encryption. Only Full Open Source extensions. Ideal for customizations. All our extensions are written following Magento® code standards. We do our best to keep quality of our extensions: performance, functional, and cross-browser testing. Detailed documentation for all extensions is available online and in PDF. Forum and FAQs. Free and friendly EST time support. Help, tips & tricks, and even small customizations will be provided. 8+ years in eCommerce. We grow to provide you even better services and extensions, and are always open to customers' suggestions.